Rick wakes up from a blackout to find someone has unlocked his safe and stolen the plans to his portal gun! Now he must get the plans back before one of his adversaries completes the assembly and gains the power to traverse dimensions. 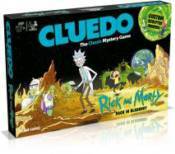 The Smith family and Mr. Poopybutthole are by his side to help nurse his hangover and find out who stole the plans, where they are hiding, and how they persuaded Rick to give up the code to his safe.